Watch an active construction site for a few minutes and you will see some amazing examples of skilled work and deft problem solving. 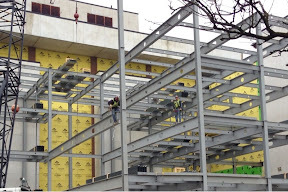 That was true today in Ann Arbor where I happened to see one complicated step in the construction of a new wing of a five-storey building. The problem was this. A fifty-foot girder was lifted by crane to its intended location within the vertical steel frame. Already I was impressed with the skill of the crane operator, who deftly maneuvered the beam into position where two steel workers were waiting on the existing beam. The crane suspended the beam in place and the steel workers bolted the near end to the frame. So far so good. But the far end was to attach to an isolated vertical beam fifty feet away, and I couldn’t picture how that end would be attached. The steel worker answered that question quickly. He scuttled the length of the beam to the isolated vertical while the beam was suspended by the crane cable and the attached end. But now the resistance of the material world intervened — the beam was a little too long to fit. The worker used two crow bars he’d brought with him to lever it into place — no good. It was just half an inch too long given the position of the vertical. So are we stymied? Need to send it back? No. The worker stood up on the beam and started gently rocking the vertical. After two or three oscillations he was able to lever the beam into place, and quickly bolted it down. It’s not a completely amazing instance of problem solving on the job, but it is impressive nonetheless. Certainly the users’ manual doesn’t have a section on what to do in this circumstance. But given his prior training, experience, and embodied skills, the worker was able to come up with a solution that worked. A part of the interest of Sennett’s work here is the help it provides in redressing the idea that mental work is professional and cognitive, while manual work is repetitive and rote. Sennett gives many contemporary examples of work that is both head and hand, both cognitive and skilled, both creative and manual. Sennett gives many examples of this kind of artisanal intelligence. Here is one from the construction of a large shopping mall in Atlanta. Sennett’s point here is that the implementation of a complex space is not simply the translation of a computer-generated architectural drawing into material form. Rather, it is a process that requires real workers to find solutions to the inevitable fact of gaps and inconsistencies in the plan–in this case, the fact that the lighting didn’t fully illuminate the space, leading to risks for pedestrians and drivers. A dominant tradition of philosophy identifies our human essence with our ability to think and reason. Descartes represents this line of thought (“cogito ergo sum”). But there is another tradition that places labor and our capacity to transform the material world at the center of the human essence. Hegel represented this line of thought, as did Marx. It is the homo faber tradition — man the creator — and all in all, it seems to do a better job of defining us. Labor and skilled intelligence lie at the core of human capacities. And that is a good thing to remember on May 1, the international day celebrating labor.